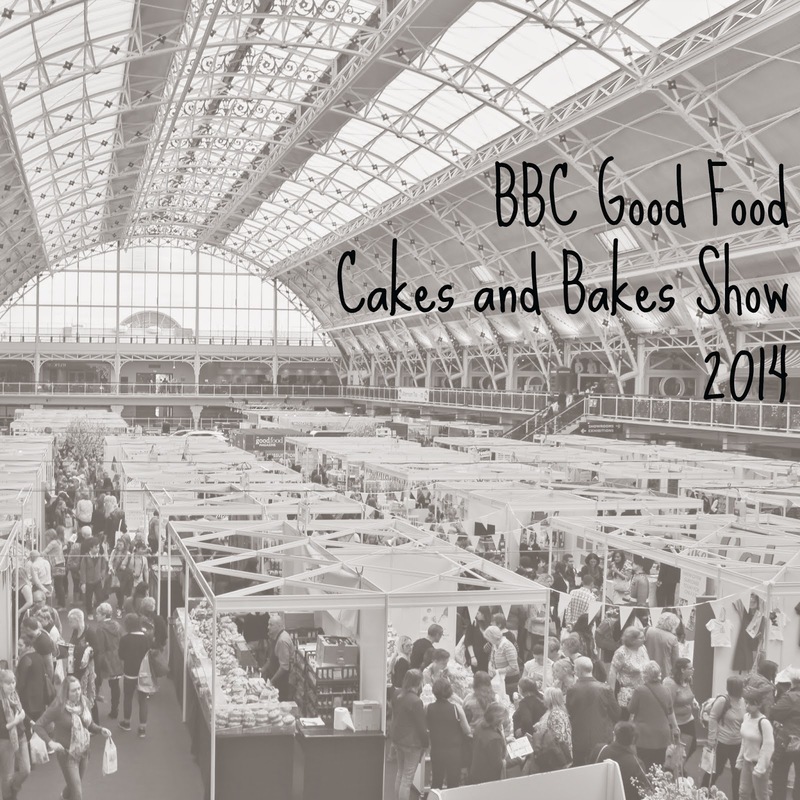 For my birthday this year I was thoroughly spoiled by my sister (like usual) as she bought me tickets to the BBC Good Food Cakes and Bakes Show, which was held in London a couple of weekends ago. I love cake and bakes, so I was excited to begin with, but when I found out that actual Mary Berry, Queen of all things cakey was going to be there, and I was going to watch a demonstration of her cooking, I just about took off! As soon as we arrived at the Business Design Centre, we spotted the interview stage with a sign next to it saying that the Queen herself was going to be interviewed in 20 minutes. Grabbing a showguide - expertly modelled by Nat above - we settled down in the second row and decided what was top of our lists to see. It felt very much like going to a music festival, but even better, it was for cake! I was seriously fan-girling as Mary Berry took to the stage, where she was interviewed by Jo Wheatley who won Bake Off a few years ago. Jo was very nervous to begin with, but as Mary is such a dream, she soon calmed down. It was really interesting to hear Mary interviewed, she was as graceful and funny as ever, telling little anecdotes and stories. As the interview stage was sponsored by Lakeland, they had a voucher to give away as a prize to whomever could answer a question posed by Mary. She asked who else was in the final the year that Jo Wheatley won, and the stumped looks on the audiences faces was universal. A little girl sat two rows behind us had her hand up though, and as Jo went towards her with a microphone the Mum said that she didn't think she had the right answer, but the girl was asked anyway and she only went and got it spot on! We were all seriously impressed with her Bake Off knowledge and Mary invited her up on stage to sit with her for a while, I was really jealous! After the interview was over, we had a while before our slot in the theatre to watch the Mary Berry demonstration (have I said Mary Berry enough times yet?!) so we had a wander throughout the maze of stalls selling their wares. I had heard of the Meringue Girls before, and when I spotted their amazingly colourful array of meringues I had to buy a few. I tried a lavender one and a strawberry one, which were both really tasty, whetting my whistle for the day of gorging on sugary yummy things. I am a huge popcorn fan, it is one of my favourite foods, and one of the few ones I believe can be both sweet and savoury. Rich bought me some Joe & Seph's popcorn for my birthday a couple of years ago, and it was really unsual and yummy, so when the stand with all of the jars of wierd and wonderful flavours was spotted, a beeline was made! Nat and I spend a good 15 minutes trying almost every different flavour they had, including mince pie popcorn - fantastic, cosmopolitan popcorn - alcoholic, and strawberry cheesecake popcorn, which was so tasty both me and Nat bought a bag to bring home with us. They've started selling Joe & Seph's popcorn in Cineworld cinemas now, much to my delight, but I am majorly regretting not buying any of the mince pie flavour as that isn't available in Cineworld. Primrose Bakery were there and when we spotted their Mars Bar cornflake cake, a slice was bought immediately. This was so good, the best cornflake cake either of us had ever had. I want to try and recreate this at home now, and if I manage to get a hold of, or crack a recipe for it, I'll post it on here too. At last our time came to head into the Theatre and watch Mary and her daughter do some cooking. We saw her make a chocolate boozy roulade, which has inspired me to potentially make a Christmas log this year, and some figgy flapjack bites, which also looked amazing. Handily all of the recipes were in the free showguides, which meant we could watch her work rather than trying to note down the recipe. We headed straight out of the theatre and grabbed some seats for John Whaite's Cookery Masterclass on chocolate. We are both huge fans of his, and it's lucky we went when we did as the seats filled up really quickly and there were people lining the walkway next to the area and sitting on the floor in an attempt to watch him at work. He gave us a brilliant introduction to tempering chocolate and was as warm and lovely as he was on Bake Off. Potentially my favourite ever winner. After all of the sweet things we'd been devouring it was about time for something savoury, so we headed to Pig In The Middle for a gourmet sausage roll each. These were okay, but would have been so much better warmed up rather than cold. However it did serve the purpose of enabling us to get straight back onto the sweet things, which we did in style. Have you ever heard of a Corker before? I hadn't, but when I spotted them at The Brownie Bar, I knew it was a must that I had one. Want a peek inside? Yep, that's a perfectly gooey brownie surrounded by soft delicious cookie. It was one of the best things I have ever eaten, and yet another thing that I need to try and make at home. I think it may be even better than a Slutty Brownie, and that's saying something! After a lot more wandering, and even more free sample swiping, we made our way back to our hotel, before carrying on with the rest of our London weekend. There will be more blog posts on the other stuff that we got up to, but this post is already very photo heavy so hence I split them out! It was a brilliant day, so thank-you very much to Nat for buying me the tickets. How on earth can I top that for her birthday next month?! I want to eat more corkers too! Wish I had bought plenty to bring home with me, but I didn't think! I highly recommend it! It may have to become a regular thing now I've been to cake heaven once, I'll keep wanting to go back! I went to the Cake and Bake Show (which is different I think!) and that was so much fun! I'm going to the Good Food Show on Friday and hoping to see Mary Berry, I'm super excited! That Corker Brownie/Cookie will be on my mind for days! The corker is still on my mind and it is weeks later!